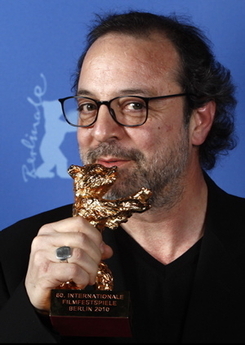 Turkish director Semih Kaplanoglu poses with his Golden Bear award for Best Film for his movie ‘Bal – Honey’ during a photocall at the 60th Berlinale International Film Festival in Berlin Saturday, Feb. 20, 2010. Did you know that 300, 000 tickets were sold at the 60th Berlin Film Festival to set a new attendance record? This year’s anniversary Berlinale celebrated another fantastic highlight with the Award Ceremony on February 20, 2010. As has become tradition, the festival again came to a close with its Berlinale Kinotag for the public on February 21. For eleven days, the Berlinale provided visitors with cinematic discoveries, touching moments and stimulating encounters. Amid a flurry of flashes from photographers and the applause of fans, countless stars strolled up the red carpet at the 60th Berlin International Film Festival. Magical pictures from the Brandenburg Gate during the live transmission of the reconstructed version of Metropolis went around the world. And with “Kiez-Kino”, a special programme for neighbourhood cinemas, the Berlinale once again paid tribute to its loyal Berlin audiences. For its birthday, the Festival registered a new attendance record, with approximately 300,000 tickets sold. What is more, the interest of industry attendees remained strong: almost 20,000 accredited visitors from 122 countries attended the Festival, including about 4,000 representatives of the press. With the Berlinale, Berlin has once again demonstrated that it is a film metropolis. The 61st Berlin International Film Festival will be held from February 10 to 20, 2011. This entry was posted in Featured, Film Festivals, News by admin. Bookmark the permalink.